The unique gait of Tripawd dogs and cats puts them at greater risk of osteoarthritis (OA), a painful condition affecting their body’s weight bearing joints. If your three-legged hero has been diagnosed with OA, you may want to ask your vet about hyaluronic acid pet supplements or injections. 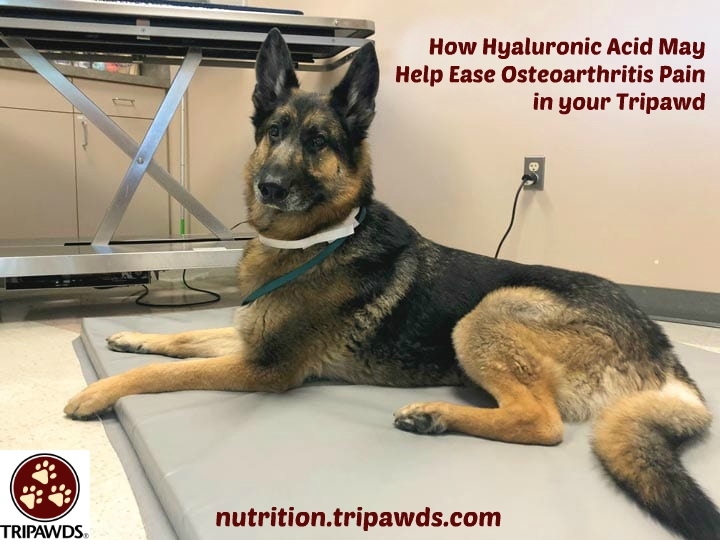 Until Tripawds Spokesdog Wyatt Ray was diagnosed with osteoarthritis and tendinopathy in his tarsus joint, we had never heard of hyaluronic acid (“HA”). But when his orthopedic veterinarian injected his tarsus joint with a steroid injection called “triamcinolone,” along with HA, to alleviate the pain, we wanted to learn more. Here’s what we discovered. Note: Some of these products have affiliate links, which means the Tripawds community gets a small commission if you buy after clicking on one. Thanks for your support! Hyaluronic acid (HA) is a naturally occurring joint lubricant that’s already in the bodies of healthy animals and people. 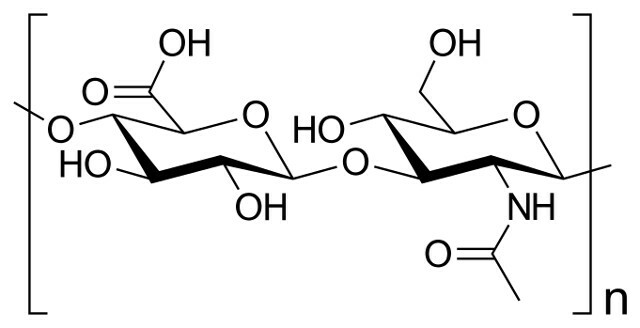 It belongs to the “Glycosaminoglycans (GAGs)” family which also includes glucosamine and chondrointin. These complex molecules are spread throughout our bodies and in our joints. They help reduce inflammation, repair and rebuild degraded cartilage and lubricate joints. 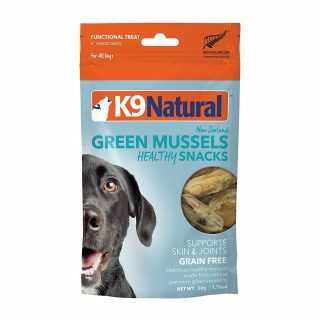 Hyaluronic acid is also found in green lipped mussels. When a person or pet has osteoarthritis, they don’t have enough lubrication in their joints. Inflammation, pain and cartilage destruction sets in, making movement difficult. HA supplementation to ease arthritis inflammation and restore joint health has been used in people for years. 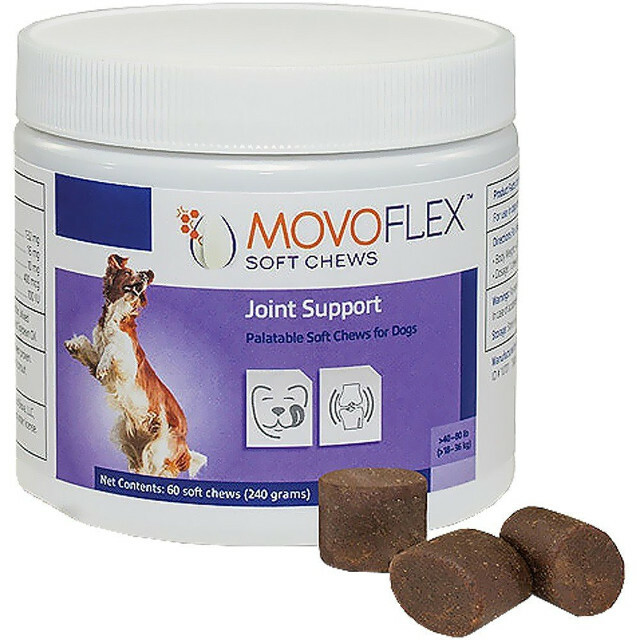 Now, vets are recommending it to alleviate osteoarthritis pain in dogs and cats. HA is safe for cats too. Why Hyaluronic Acid for Osteoarthritis Pain Relief? 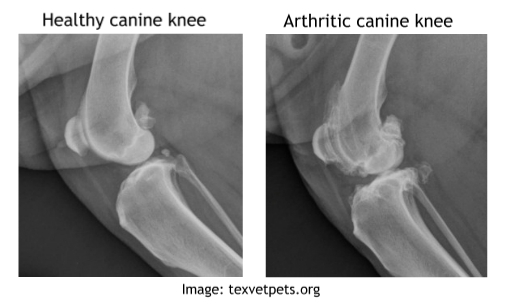 Peer-reviewed veterinary studies conclude that increasing HA in osteoarthritic people and pets may help improve mobility and possibly prevent osteoarthritis from getting worse. One of the easiest ways to boost HA is through hyaluronic acid pet supplements. 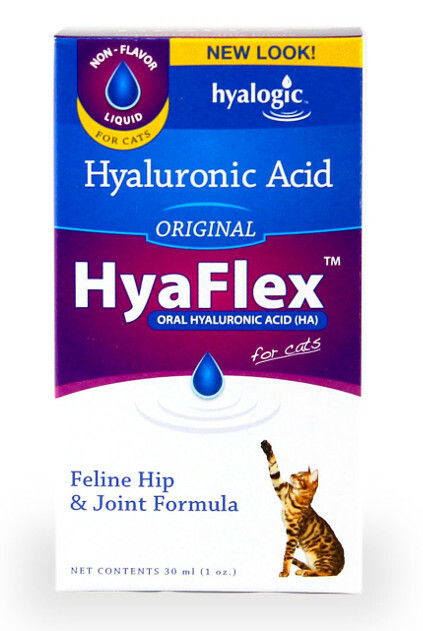 Hyaluronic acid can be injected into the affected area by your veterinarian. Research shows that all methods produce similarly effective results in reducing osteoarthritis pain. HA is overall very safe and has little if any interactions with other medications and supplements. About the only risk of hylauronic acid is during the injection procedure, when infection could set in. Any time you turn to supplements for you or your pet, you’ll need to be patient. You won’t see instant results as you do with pharmaceutical pain relief medications. Generally it takes several weeks before seeing a noticeable difference. Your vet may also recommend continuing with conventional pain relief until you see results. It took about four weeks for HA results in Wyatt Ray. Also remember that the quality of over-the-counter supplements varies wildly. Check with your vet to see which osteoarthritis pain relief products they recommend. If you use a human HA supplement, visit ConsumerLab.com to see if it meets label claims. If your pet receives a HA injection, the results can last anywhere from three to six months. Unfortunately, some dogs do not respond at all. But if you’re willing to give it a try, it could give great osteoarthritis relief for your Tripawd. After Wyatt Ray had an HA injection, it took about four weeks until we noticed his mobility was stabilized. Although the HA didn’t completely restore him to his previous mobility level, we do believe it has kept the tendinopathy in his tarsus from getting worse. Along with regular pain medications and appropriate exercise for a Tripawd, he’s holding his own for a ten year old amputee dog. If you have tried HA for yourself or your Tripawd, we want to hear about it. Be sure to comment below and share your story.